Let us analyze what supply and demand are, and how relevant the expression "market memory" is. The screenshots show the operation of the SupDem-Pro custom indicator, it is the improved version of my previously created Shved Supply and Demand indicator. In order to create it, I gave up trading for almost 3 years and studied a lot of literature, I have not traded during this time, but only analyzed the behavior of the price in different situations. It took me quite a long time to correctly formulate the task to the programmer. The indicator looks for zones which have an imbalance between supply and demand (buyers and sellers) and displays them on the charts for any instruments and timeframes. Red zones - supply zones, which are dominated by sellers. Green zones - demand zones dominated by buyers. 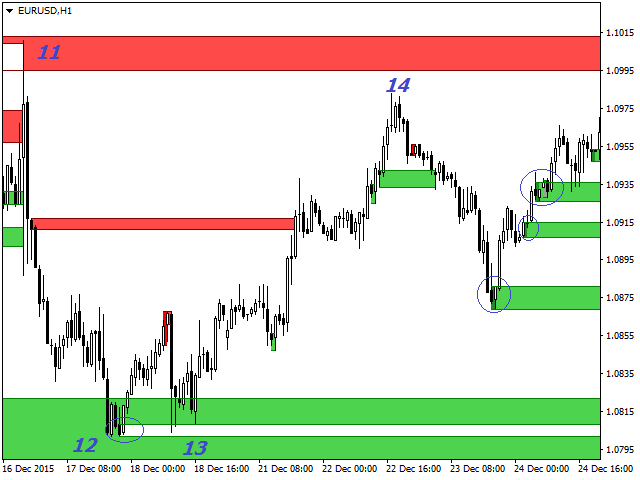 Eur/Usd H4 chart. The circle shows the formation of the supply and demand zones. The experienced traders, who intend to sell, are more likely to be at point 1, as they know that the chances of price falling are above 50%. This is the first test of the supply zone and sellers win over the annoying buyers. But buyers, with enough courage, managed to stop them at point 2. At point 3 the sellers are still in the lead, but suppressing the buyers becomes harder and harder. This is the second zone test: the price moved even higher from the previous High of the point 1. Point 4 - test of the zone. At point 5 there was a war between the buyers and sellers, which lasted the whole day, each side fought to the last, but still at the end of the day the buyers won and started pushing the price higher and higher with almost no rollback. However, sellers prepared for the next meeting at point 6 and were ready, the buyers had little chance to take them by storm. 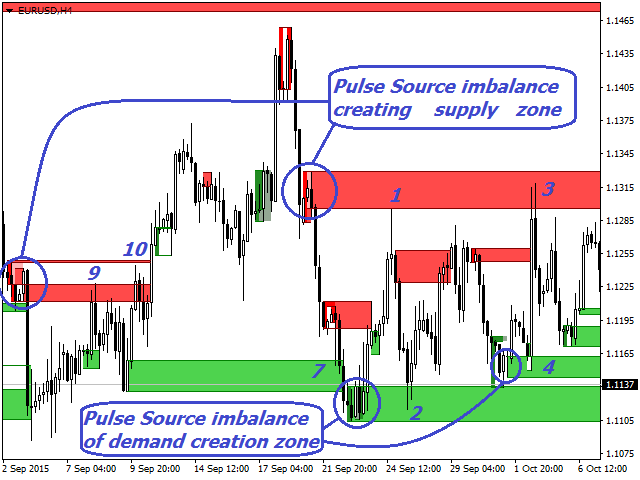 At points 7,8,9,10 it is shown how the price reacts to the supply and demand zones. At points 11, 12, 13, the price approaches the demand zone on the daily chart and gradually slows down. 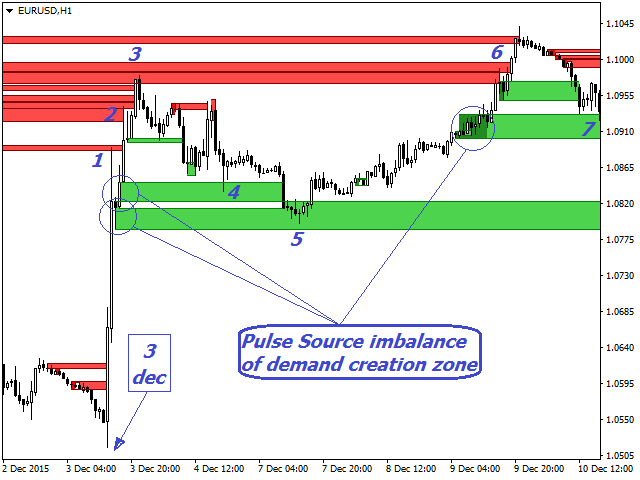 At point 14 it comes up close to the demand zone, on the daily chart the result is the movement of 450 points. Let us analyze the price movement on the Eur/Usd H4 chart, as the А-А section but on a smaller H1 timeframe, in order to understand how the supply and demand zones work so to speak under the microscope. Our movement was on December 3rd. Circles mark the formation of supply and demand zones. At points 1,2,3 it is clearly visible how the price tries to overcome the supply zones formed earlier. After the price could not overcome the supply zone at point 3, it pulls back to the closest newly formed supply zone. The reaction to these zones is the price behavior at points 4 and 5. After the correction the price manages to push through the supply zone at point 6. 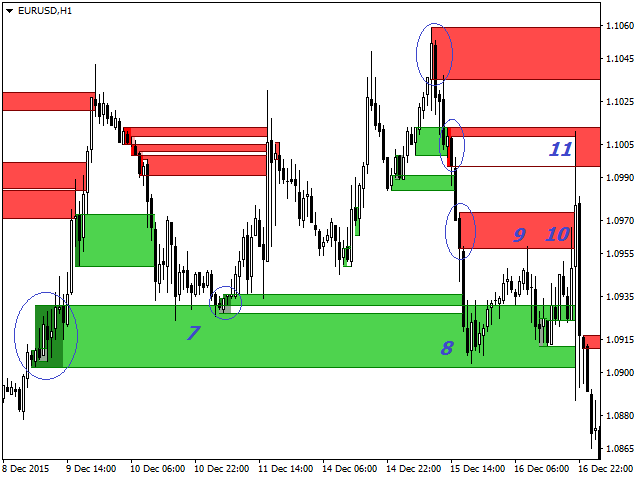 But it can not rise higher H4, as it is limited by the last supply zone it could not breach on H4. 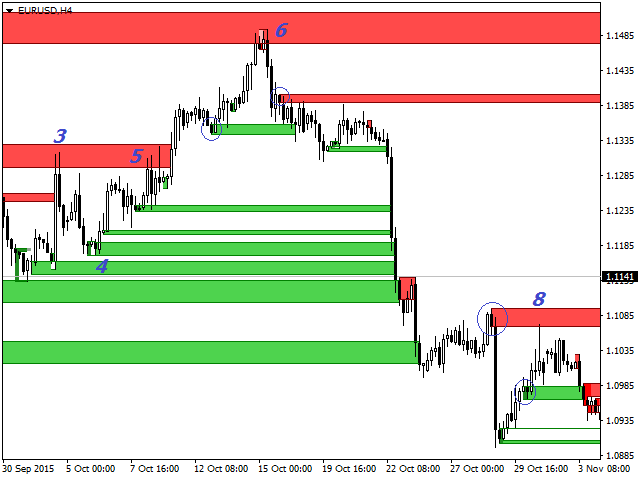 After the consolidation the price searches for the nearest demand zone, the reaction of points 7 and 8. On the way up there is another fresh supply zone - the reaction of points 9, 10, 11. After the failure the price starts to move to the nearest zones, points 12, 13, 14, 15. Result: The supply and demand zones are always present everywhere, on any instrument and timeframe - these are the main laws of the market, the novice traders should start with this. 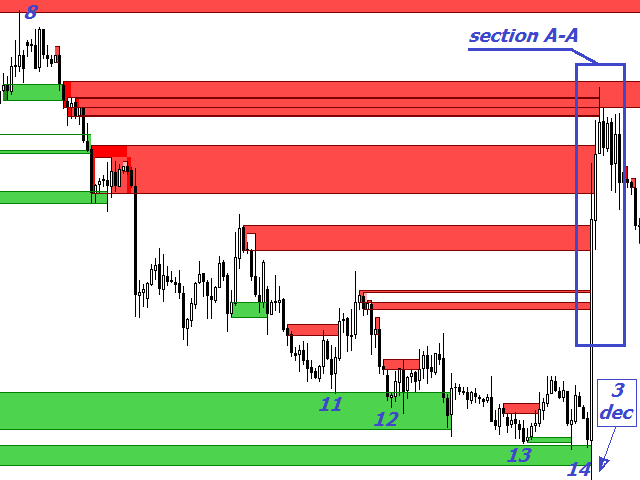 If you trade the supply and demand zones, you have to analyze the situation of the instrument on all available timeframes. Because the demand zone on one timeframe can be located, for example, inside the supply zone of the smaller or higher timeframe. So consider this - when testing in demo mode (only 1 timeframe) the zones will trigger and will be broken, this will always happen, it is just that one side (buyers or sellers) can not control the demand or supply zone forever, someone always wins. This indicator serves for such analysis. 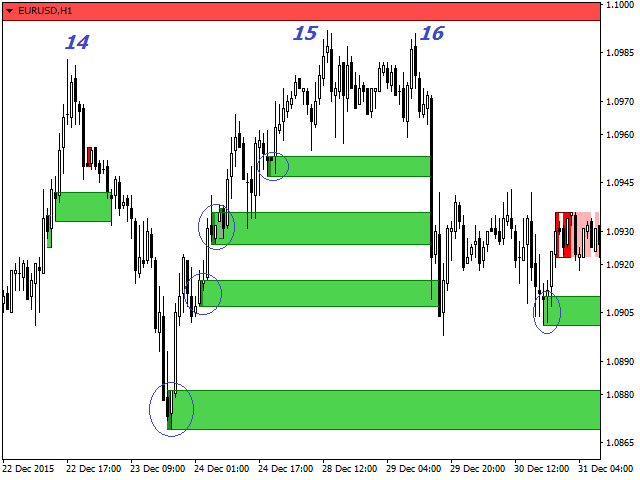 It is able to display the supply and demand zones on any instrument and timeframe (M5,M15,M30,H1,H4,D1,W1). Also you must always remember that any, even the most powerful movement can be stopped by a zone on a smaller or higher timeframe. Respectfully, I do not believe this is worth 100 dollars a year. Five bucks a month is more reasonable. Why so much? Because it is a support/resistance indicator? I own six others that do the same thing. I tried to follow your explanation in the market place overview, but I cannot follow your reasoning. How do I locate "pulse source?? I personally like the one by Bernhard. I paid 88.00 a year and he doesn't try to justify anything. It is a simple indicator that does what it is supposed to do. You get a three star for providing a support/ resistance indicator. I would say that your indicator is better than all the free supdem indicators that are available. I cannot say how it compares with some of the professional ones. But I am testing. 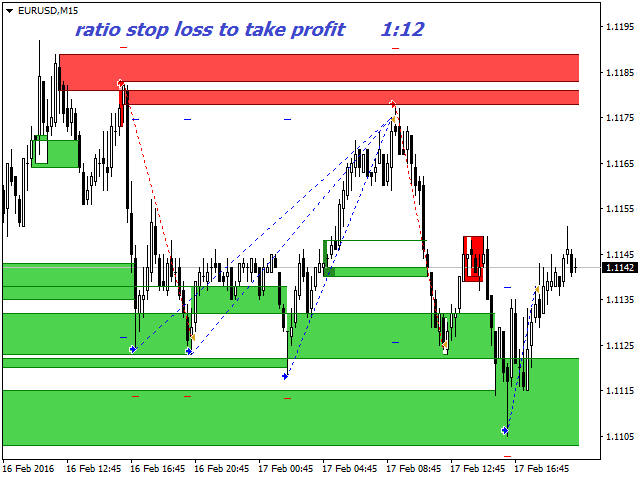 NOTE: It does not work very well on M1 timeframe. But works fine for higher timeframes. Труд грандиозный, разработчику огромная благодарность и уважение! Очень облегчает работу и при определённом навыке может стать "граалем".